The beach at the Pacific Ocean in Santa Monica marks the western end of 2,448 mile long former Route 66 - from here the original road survives for 80 miles through the northern Los Angeles suburbs, where it is known variously as Santa Monica Boulevard, Sunset Boulevard, Huntington Drive, Colorado Boulevard and Foothill Boulevard amongst other routes, and into San Bernardino beneath the edge of the San Gabriel Mountains. A little way north of this city, I-15 has replaced the original route through Cajon Canyon, the course of the San Andreas Fault, where it follows beside the lines of the Union Pacific railroad. 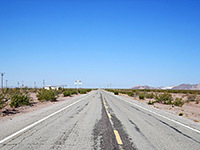 Beyond the mountains, the interstate enters the wide open spaces of the Mojave Desert and the rail tracks veer south for a while, later meeting I-15 again at Victorville where Route 66 reappears. From here to the Arizona border the highway is essentially complete, and a drive starting from this point is a great alternative way to cross the Mojave and see what remains from the more relaxed era of travel now gone forever. All of the most scenic section, from west of Ludlow to the vicinity of Needles, is part of the new Mojave Trails National Monument, created February 2016. Victorville is quite a sprawling community, split in half by the wide but usually bone dry Mojave River. Route 66 is now known as the National Trails Highway and leaves town to the north, right next to the railway and the river, all three of which curve through mostly arable, unspectacular land for 40 miles, through Helendale to Barstow where the road forms Main Street in the center of town, then continues close to I-40 - on the north side at first, it crosses over at Newberry Springs, passes over the Troy Lake Bed, re-crosses at Pisgah near a large area of lava then changes over to the south side once more at Ludlow. From Ludlow, Route 66 finally parts company with the interstate and heads into the desert back-country, start of the emptiest, most scenic and atmospheric section in California - for the next 75 miles the old highway encounters only occasional settlements, the majority of which are abandoned, and with long straight undeveloped stretches in between. Some places such as Klondike, Siberia and Bagdad are now no more than names on a map, with nothing to indicate their former life. 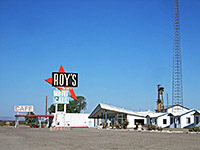 The first village that still functions is Amboy (population about 4), which has a railway depot and one business - the photogenic and recently restored Roy's Cafe and Motel - and is set in an interesting region with an expanse of black lava produced by Amboy Crater to one side and the great white flatness of the Bristol dry lake bed to the other. Other structures of interest include a row of derelict homes on the west side of the settlement, and the abandoned Amboy School, which closed in 1999. Further east along the road, around the edge of the Marble Mountains, Chambless and Cadiz also contain various forlorn, derelict buildings - restaurants, gas stations and homes. Notable structures in Chambless are an old, isolated restaurant to the west and an empty, whitewashed building in the center, bearing the town's name. Beyond Chambless a dead straight 20 mile section passes through more stark desert scenery, lined in one part by a long, low ridge where countless people have recorded their name, created with light-colored stones placed on the darker earth. Generally the road hereabouts is much less settled than in Arizona and has fewer travellers, and a lot more desert. 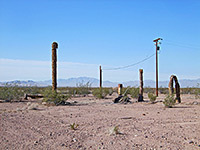 The occasional villages that remain have none of the commercialism, Route 66 souvenir shops or reproduction road signs that are found quite often between Kingman and Williams. Soon after Essex - a cluster of a dozen houses, still just about inhabited - the road forks as it re-approaches I-40. One branch (Goffs Road, the main route) crosses the interstate at exit 107 and the other (the National Trails Highway) at exit 115 then both rejoin at the old rail town of Goffs, now just another collection of mostly abandoned buildings, though a few businesses survive, one a museum with a large collection of artifacts. 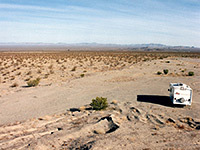 From Goffs, the initially paved Lanfair Road heads north into the Mojave National Preserve, passing just a few houses, but otherwise empty lands. 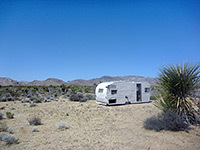 There are several good places to camp along these eastern parts of Route 66 and one of the best is along the National Trails Highway northeast of Essex, beside some piles of gravel on the north side - this site has uninterrupted views in all directions including about 30 miles of the distant interstate and railway tracks. From Goffs, Route 66 descends eastwards towards the Colorado River Valley, ending where US 95 meets the interstate. The next remaining stretch begins just over the Arizona border at Topock. 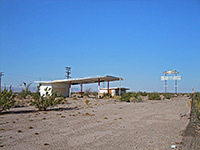 Towns with hotels along Route 66 in California include Victorville, Barstow and Needles.